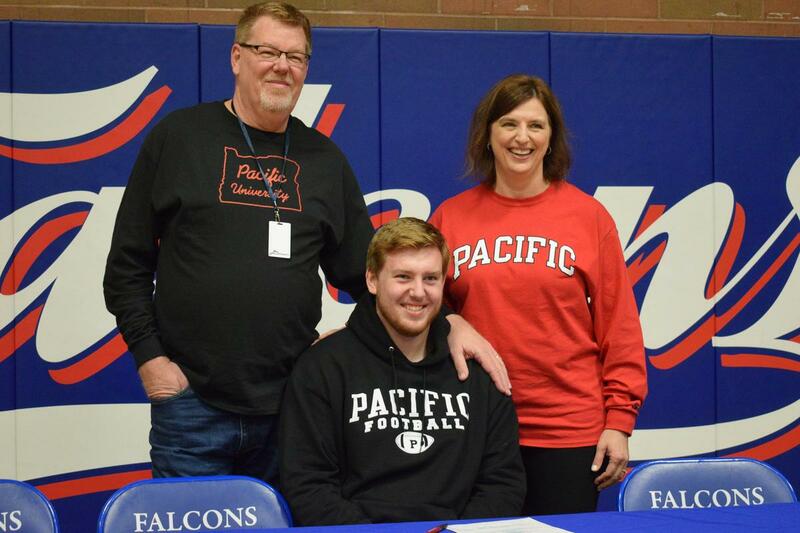 As his coaches, teachers, friends, and family gathered around him, Lucas Van Wagner ’19 signed a letter on Wednesday declaring his intent to play football and throw for Pacific University in Forest Grove. Assistant Athletic Director Aaron Hazel described Lucas as an "integral member" of La Salle's football and track teams. "More importantly, he is a great teammate," said Hazel. "The kind of person who is constantly trying to make people around him better." In addition to being an accomplished athlete – he was selected as an all-league offensive lineman – Lucas is an award-winning artist. He's also shown he has a heart by organizing drives to collect coats for the needy. “Lucas epitomizes the kind of student-athlete we want to form and send off to college,“ said Athletic Director Chris George. 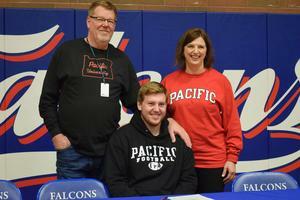 Lucas plans to study psychology and art at Pacific, where both his parents, Chris and Brian Van Wagner, studied and played basketball.